Situated in a remote corner of the Payette National Forest, the Stonebraker family homestead and ranch came to represent many firsts for westering families in central Idaho. The men of the migratory family that called the Chamberlain Basin home flexed their entrepreneurial talents, prospering from opportunities supplied by nearby mining communities. Their well-photographed history portrays the complicated work of homesteading Stonebraker women. William Allan Stonebraker and his family were among the first non-Native American migrants to homestead in Idaho’s Chamberlain Basin along the Salmon River. Their 409-acre homestead and ranch, established in 1898, generated lucrative ventures for the Stonebraker family. In its early days, the homestead survived by raising beef cattle for neighboring gold rush communities like Thunder Mountain. 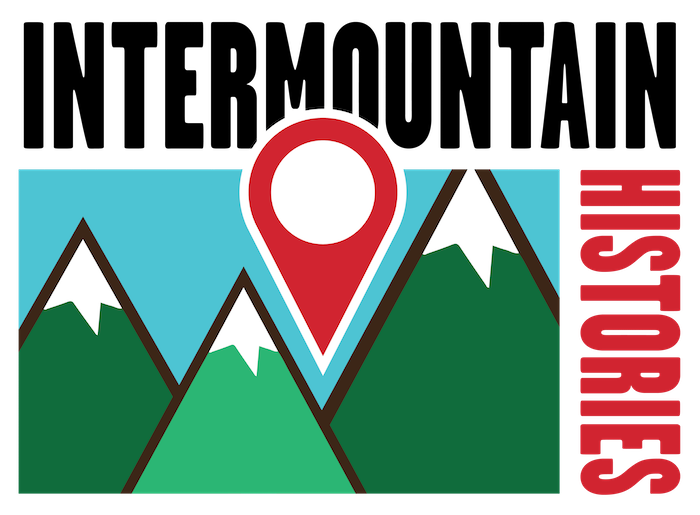 In 1900, William, already a practiced freighter, struck gold when he won a trail construction contract connecting Grangeville to Thunder Mountain— later known as the Three Blaze Trail. Eventually, he worked as a pack train operator along this route, started his own pack train business in Stites, and lead hunting excursions from his homestead. In the 1920s, following these endeavors, he adapted his homestead into a dude-ranch. All the while, William brought along his camera. The experiences of the Stonebraker men and their expeditions in mining, ranching, and big game hunting are well documented in the Stonebraker Photograph Collection, donated to the University of Idaho library in 2003. However, little is shown of the Stonebraker women who remained on the family homestead during their husband’s and brother’s entrepreneurial outings. Out of 540 photographs, less than 50 images of William’s first wife, Lillian Carter, second wife, Golda, and various sisters, friends, and daughters survive in the collection taken by William between 1900 and 1934. The photographs that exist offer a glimpse into these women’s lives as homesteaders. In the late nineteenth century, white women in working-class families traditionally performed homemaking tasks like child rearing, cooking, cleaning, baking, sewing, and laundry. For women homesteaders, household labor also included planting, feeding, plowing, herding, cultivating, harvesting, culling, gathering, processing, storing, preparing, and selling or serving the food products gleaned from their homesteads. Photographs in the collection depict the Stonebraker women in trousers and work boots, indicating that they worked outside and handled livestock, particularly in the homestead’s later years as a dude-ranch. Farm work and interactions with livestock signify that the Stonebraker women occasionally transcended the rigid gender notions of nineteenth century homemaking. Homesteading often demanded from the Stonebraker women increased responsibilities in outside work that surpassed the antebellum domesticity ideals of the time. Their work in the Chamberlain Basin would end abruptly following William’s death in 1932. Golda sold the Stonebraker homestead shortly thereafter and, eventually in 1975, the homestead was acquired by the Forest Service. The cabin on the Stonebraker property still stands today, however it is reachable only by “horseback, foot, or air”, serving to remind of the homestead’s remoteness and enduring testament to the forgotten women who worked to keep it operating. Women with Binoculars at Stonebraker Ranch: A group of women looking through binoculars in the Stonebraker Ranch. ~ Source: Women with Binoculars, 1902, Stonebraker Photograph Collection, Digital Archives, University of Idaho, Moscow, ID. https://digital.lib.uidaho.edu/cdm/singleitem/collection/stonebraker/id/251/rec/4 (accessed November 6, 2017). 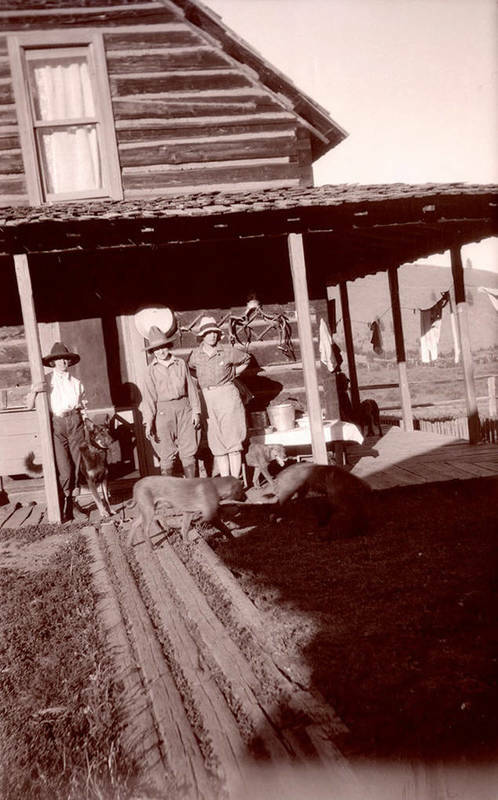 Three Women at Stonebraker Ranch: This photograph, taken in 1928, shows three women at the Stonebraker ranch. ~ Source: Three Women At Stonebraker Ranch, August 20, 1928, Stonebraker Photograph Collection, Digital Archives, University of Idaho, Moscow, ID. https://digital.lib.uidaho.edu/cdm/singleitem/collection/stonebraker/id/124/rec/2 (accessed November 6, 2017). 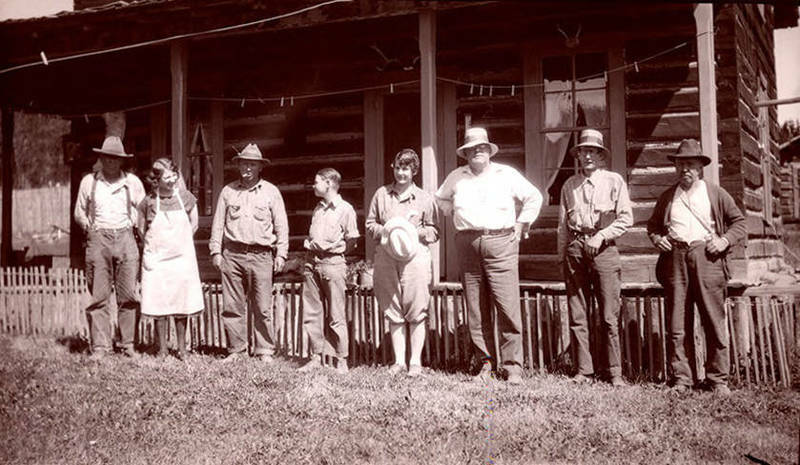 Group at Stonebraker Ranch: A group at Stonebraker Ranch, taken in 1929. ~ Source: Group At Stonebraker Ranch, July 14, 1929, Stonebraker Photograph Collection, Digital Archives, University of Idaho, Moscow, ID. https://digital.lib.uidaho.edu/cdm/singleitem/collection/stonebraker/id/182/rec/17 (accessed November 6, 2017). 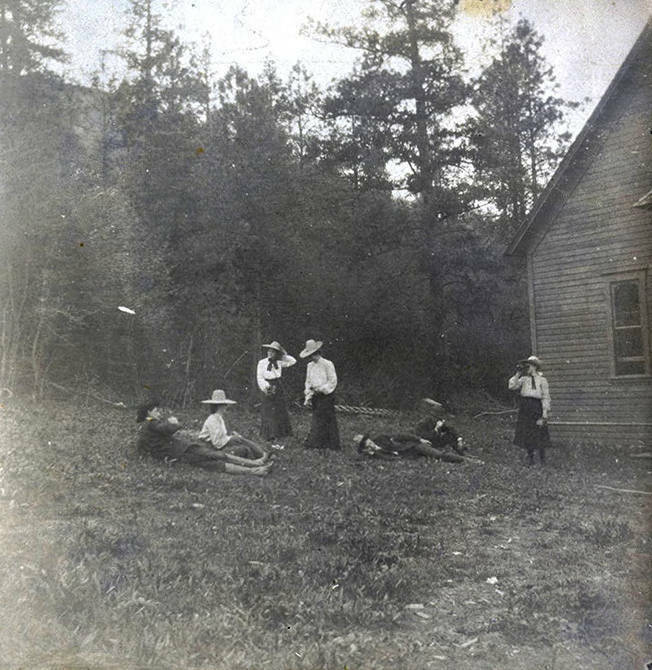 Alleah E. Schweitzer, University of Idaho, “Investigating Women's Labor on the Stonebraker Family Homestead,” Intermountain Histories, accessed April 19, 2019, https://www.intermountainhistories.org/items/show/109. Garceau, Dee. “Nomads, Bunkies, Cross-Dressers, and Family Men.” In Across the Great Divide: Cultures of Manhood in the American West ed. Basso, Matthew, Laura McCall, and Dee Garceau. Abington, UK: Routledge, 2001. Grove, Clara P. “Interview #4,” Interview by Sam Schrager, Latah County Oral History Collection, December 16, 1975. https://www.lib.uidaho.edu/digital/lcoh/people/interviews/viewer.php?cachefile=Grove4.xml (accessed November 6, 2017). Passehl-Stoddart, Erin. “About the Collection,” Stonebraker Photograph Collection, https://www.lib.uidaho.edu/digital/stonebraker/about.html (accessed November 6, 2017). Simonsen, Jane E. Making Home Work: Domesticity and Native American Assimilation in the American West, 1860 – 1919. Chapel Hill, NC: The University of North Carolina Press, 2006. Three Women At Stonebraker Ranch, August 20, 1928, Stonebraker Photograph Collection, Digital Archives, University of Idaho, Moscow, ID. https://digital.lib.uidaho.edu/cdm/singleitem/collection/stonebraker/id/124/rec/2 (accessed November 6, 2017). Warren, Louis S. “Cody's Last Stand: Masculine Anxiety, the Custer Myth, and the Frontier of Domesticity in Buffalo Bill's Wild West.” The Western Historical Quarterly 34, No. 1 (Spring 2003): 55. Webb, Anne. “Minnesota Women Homesteaders: 1863 – 1889.” Journal of Social History 23 (Fall 1989): 126. Wood, Margaret C. “Working Class Households as Sites of Social Change.” In Household Chores and Household Choices: Theorizing the Domestic Sphere in Historical Archaeology ed. Kerri S. Barile, 210-212. Tuscaloosa, AL: University of Alabama Press, 2004.